Don Paul: Requiem for a glacier? 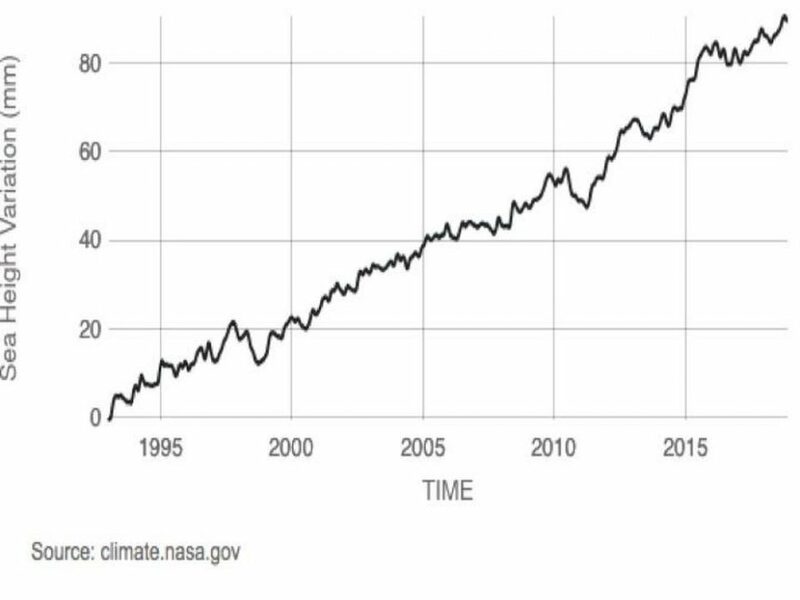 2018 was the warmest for the oceans on a global basis since ocean heat has been measured, going back to the late 1950s. The oceans serve as a great sponge for absorbing atmospheric heat and carbon dioxide, taking up 90 percent of the warming from the air. A significant portion of that absorption has been occurring in the Arctic region and near Greenland. The Greenland ice cap and its glaciers have generally been shrinking and melting most of the time in recent decades. A whopping exception to that trend has turned up very recently in Greenland. The massive Jakobshavn glacier in Greenland up until 2014 along with four other glaciers accounted for 30 percent of the 739 gigatons (about 815 billion tons) of Greenland ice mass lost in recent years. This week, NASA’s Jet Propulsion Laboratory reported this glacier, pictured below, has had an unexpected change. 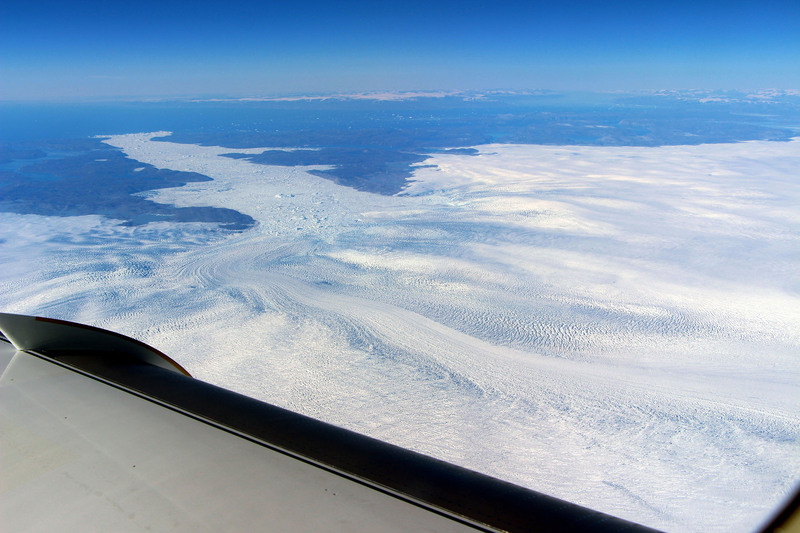 A recent NASA image of the massive Jakobshavn glacier in Greenland which has significantly slowed its loss of mass. What had been the fastest thinning large Greenland glacier has significantly slowed its loss of mass. While it is still losing more ice to the ocean than gaining mass from snow accumulation, it has again begun moving toward the ocean instead of retreating inland as it had been for decades. As seen in the NASA image below, the path of retreat with dates can be seen, along with the new large-scale advance. 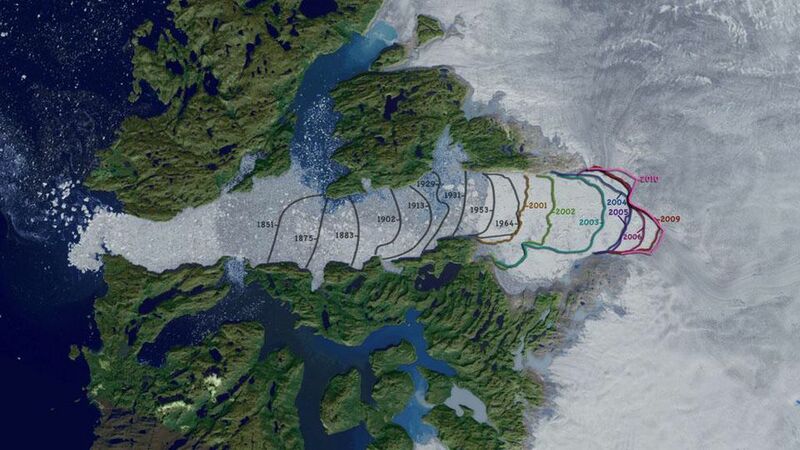 NASA image shows the path of the Jacobshavn glacier retreat with dates, along with the new large-scale advance. The source of the colder water originates in an area more than 600 miles south of the glacier. There is a shift occurring in the North Atlantic to a colder phase. The North Atlantic Oscillation/NAO appears to be heading into this phase which will dominate for some years to come, at least on the southwest side of Greenland. Some of you have heard me refer to the effect of NAO phases on our weather in the winter months. This is a matter of a change in ocean currents swinging up from the southern end of Greenland along its west coast, bringing in colder water than had been present for several decades. The ice thickness of the glacier had lost 500 feet during those decades, but now, unexpectedly, has gained back 100 feet in thickness. Tracing the source of where the colder ocean water originates was a difficult task, and a sophisticated ocean model brought into play helped solve the initial mystery. NASA gauges Greenland ice and trends with numerous technologies. Since the Jacobshavn glacier had been the pathway for 7 percent of Greenland’s ice mass loss, this shift is clearly of importance. The prevailing evidence ties the change to the colder phase of the NAO. If that is the case, the shift may persist for five to 20 more years, and was an important reminder that global trends can be temporarily mitigated on a regional scale by shifting ocean currents. “Dr. Josh Willis, lead scientist for NASA's OMG mission at the Jet Propulsion Laboratory, warns: "Jakobshavn is getting a temporary break from this climate pattern. But in the long run, the oceans are warming. And seeing the oceans have such a huge impact on the glaciers is bad news for Greenland's ice sheet. This relatively good news should not be overplayed. 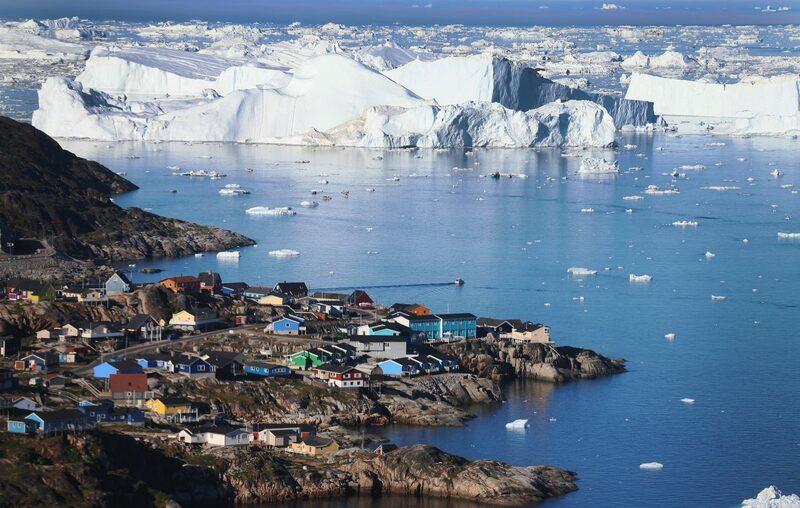 Up to this point, a 2019 National Academy of Sciences study showed Greenland’s ice mass had been melting 4 times faster than predicted. Some of the rapidity of that melt was also tied to more water vapor and liquid water clouds in the regional atmosphere due to more evaporation from warming ocean waters. Greenland’s surface had also darkened where melting had occurred, and those dark areas absorbed more solar energy. The regional trend change is not a global trend change. Even in this region, the researchers feel when the NAO again shifts to a warmer phase, Jakobshavn will shift back to a rapid meltdown. In the meantime, global mean sea levels will continue to rise.